An attacker stabbed two police officers in Brussels on Wednesday (5 October) in a possible terror incident, the latest attack in a city still reeling from deadly Islamic State bombings in March. Police shot the man in the leg after he used a knife to attack the two officers, one female and one male, in the Schaerbeek area of the Belgian capital before breaking the nose of a third officer. Prosecutors identified the attacker as 43-year-old Hicham D., a Belgian national. Reports said he was a former soldier with ties to jihadists who had gone to fight in Syria. 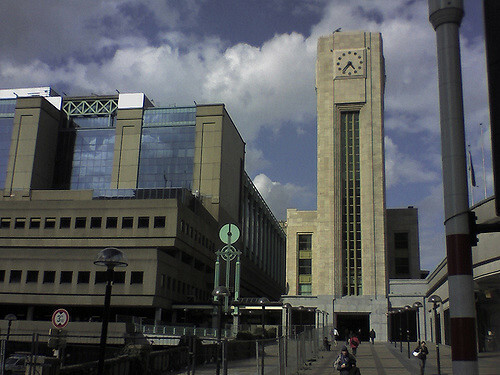 The incident came shortly after one of the main train stations in Brussels and the city’s prosecutor’s office were shut by a bomb scare which later turned out to be a false alarm. “We have elements to believe that the (stabbing) incident was a terrorist attack,” Eric Van Der Sypt, a spokesman for the Belgian federal prosecutor’ office, told AFP. “At noon two police officers were attacked by a man with a knife on the Boulevard Lambermont in Schaerbeek. Their life is not in danger,” the prosecutor’s office said in a statement. An unnamed eyewitness told RTBF television: “I saw the attacker striking the policeman on the ground. He got on top of him and was punching and kicking him. The policeman rolled into the bushes but he followed him and kept hitting him. Officials said one police officer was stabbed in the neck and the other in the stomach. Police later searched the suspect’s house in Schaerbeek but found no weapons or explosives, Van Der Sypt said. The suspect remains in police custody and a terrorism judge will decide whether to keep him in detention. Hicham D. served in the Belgian army until 2009, a source close to the inquiry told AFP. Belgian media said he was already known to the authorities for being in contact with jihadists who had gone to fight in Syria, but the source was unable to confirm that. He was also a one-time professional boxer who stood as a candidate in local elections for an Islamist party, RTBF reported. Belgian media said he had been hit by a police car in 2011 and had said at the time that police had tried to kill him. Wednesday’s stabbing took place on a day of tight security as Brussels hosted a major conference of international donors to raise billions of dollars in aid for Afghanistan. 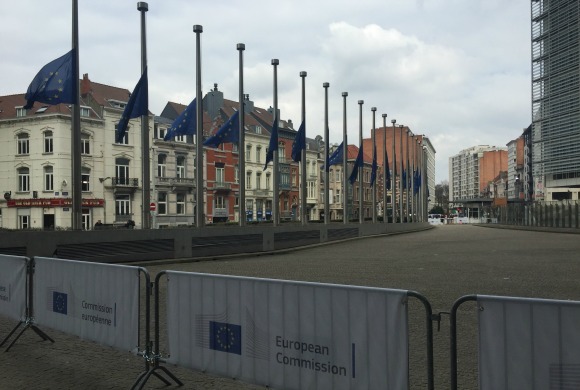 European Union headquarters, where the conference was taking place, are about four kilometres (two and a half miles) from the scene of the knife attack. The stabbing comes two months after two policewomen were wounded in the southern Belgian city of Charleroi by a machete-wielding man who shouted “Allahu Akbar” (God is greatest). Belgium remains on its second highest terror alert level following the March 22 IS suicide bombings on the Brussels metro and airport in which 32 people were killed. Schaerbeek, much like the nearby district of Molenbeek, was deeply connected to the Brussels attacks. A bomb-making factory for the Brussels bombings and the November 2015 attacks in Paris was located in Schaerbeek. The neighbourhood was also the home of Najim Laachraoui, one of the three suicide bombers at Brussels airport who also served as the bomb-maker for Paris. The three Brussels suicide bombers left for the airport from a hideout apartment located in Schaerbeek.